Creating a fundamental infrastructure that equips local people to participate in sustaining and expanding upon our work to meet the changing needs of future generations. 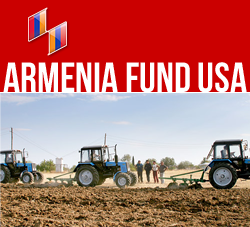 Armenia Fund USA was a major contributor to the Goris-Stepanakert (“East- West”) Highway. Spanning 41 miles, the Highway serves as the lifeline of Karabakh, allowing for exchange between Armenia to Nagorno-Karabakh and providing people with food, basic supplies and equipment. The Goris- Stepanakert Highway cost $11 million and was completed in 1999. Armenia Fund USA was the sole financer of the Shekher Bridge, which spans the Varanda River and connects two sections of the North-South Highway, the “Backbone of Karabakh”. With over 49 miles completed to date, Karabakh’s North-South Highway, for which Armenia Fund USA has been a major contributor, will serve as Karabakh’s backbone. By linking more than 100 towns and villages by 2006 the Highway will serve as the “Backbone of Karabakh”, increasing economic activity and allowing villagers to access supplies, markets and healthcare. The project is estimated to cost $25 million and will span 105 miles. In the earthquake zone, Hayastan All-Armenian Fund and select affiliates have constructed and repaired 210 residential buildings and houses for 960 families in the last decade. Residences ruined by the war in the villages of Vahjuhas and Haterk in the Martakert region have also been refurbished. In the past ten years, Hayastan All-Armenian Fund and select affiliates have constructed and reconstructed 20 water-mains, spanning close to 80 miles in length in the following regions: Nagorno-Karabakh, Syunik, Armavir, Lori, and Aragatsotn Marzes in Armenia.